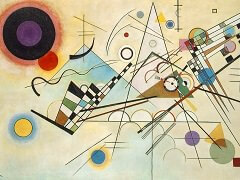 The very size of Composition V indicates the significance that Kandinsky himself attributed to this work. 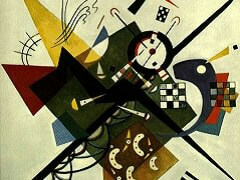 The painting provokes a diversity of problems. To concentrate on one of the more distinct of these, it evidently lacks space in the traditional sense. There appear to be neither volume nor interstices; there is no indication of foreground or background, no evidence of light or atmosphere which may create the illusion of space. The pictorial elements are not applied in order to depict existing objects or to characterize tangible materials. Moreover, the work is not based on the perception or observation of things in nature. 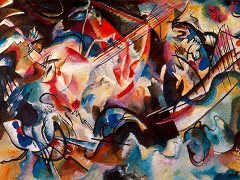 Thus far this description may very well be acceptable as a definition of abstract art in general and would be applicable not only to Kandinsky's own early abstract work but also to the later work of such divers artists as Piet Mondrian, Kupka, or Malevitch. How then are we to classify Composition V? As "abstract," "nonrepresentational," "nonobjective," or as an example of "absolute painting"? In posing such perplexing questions it must be kept in mind that any classifications or stylistic nomenclatures (such as Baroque or Dada) are hardly precise if applied to an individual work of art. In attempting to find an adequate solution, let us consider the artistic representation of space. The artist of the Renaissance, confronted with and enjoying a "whole" and "objective" world, projected his conception of space onto the canvas by making use of the art of perspective. 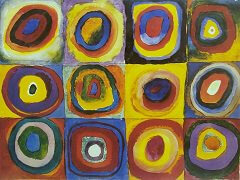 Although Kandinsky evidently did not depict that kind of measurable space by means of a geometrical construction, his early abstract paintings nevertheless possess a certain unvoluminous, nonatmospheric spatial quality which manifests itself through the inherent properties of the colors, some of which appear to be closer to - and others more distant from - the eye. Kandinsky's space also possesses continuity and homogeneity, and by representing but a particle of the whole it implies infinity. 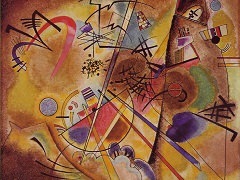 Kandinsky's space cannot be regarded as the result of an "abstraction" because, by definition, an abstraction must be drawn from something in existence. 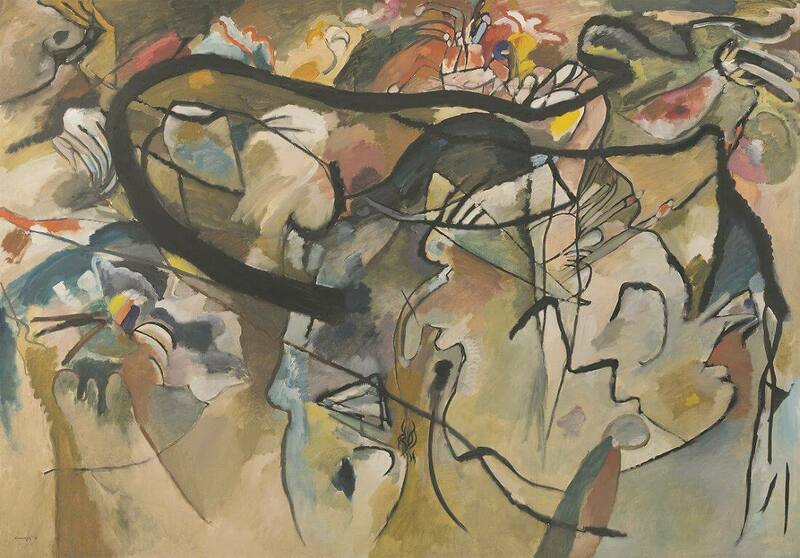 However, in as much as some of his more figurative motifs resulted from contractions and reductions of "normal" human or animal forms, the term "abstraction" would seem justified. "Nor representational painting" is not an adequate term for his figurative abstractions either, or, indeed, for his later paintings of geometric or amoebic shapes and forms. And as the "nonobjective painting," is not the bold black line which dominates Composition V in itself an "object," just much as the later circles and triangles are objects, in sense that they are concrete and visible elements? In spite of its somewhat disturbing philosophical tense, the term "absolute painting" may in fact come closest to defining Kandinsky's art because in his work something new was "absolved" from tradition and "set free" its own right. And the finished paintings were not related to nor dependent upon any antecedents. 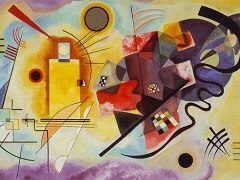 Kandinsky's space is purely subjective and can only be defined by itself. Or, in more general terms, in the words of Werner Heisenberg: "It may not be an over-simplification to state that man on this earth, for/ the first time in history, is faced only by himself - he car no longer find any other partner or opponent." 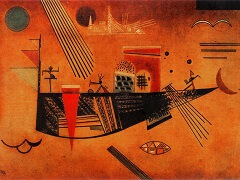 In view of the fact that Kandinsky, at this time, felt him self to be in an apocalyptic situation, it should not be to surprising to discover that Composition V is yet another dramatic expression of his preoccupation with death and resurrection. 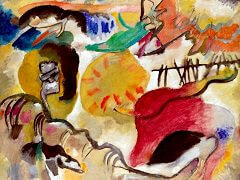 There are the trumpeting angels of the Last Judgment, the Ascension of Elijah, the downfall of a city, and many other elements of Kandinsky's iconography from the earlier paintings. The dominating black line and its iconographical meaning can be traced to the glass painting with the Archangel Gabriel, the prophet of death and birth.